Is your week off to a good start? I wasn’t kidding on Friday when I said it would probably be a pajamas-all-day kind of weekend. We had nonstop rain which meant soccer game cancelled and I literally did not leave the house for two days! It was so nice! And even better with those “soft pants”. Did you pick up a pair? Definitely get some in time for this weekend (they’re 40% off with code ‘BOO’ today). They’ll be the thing you change right into as soon as you get home from work everyday, promise! When I’m not in pajamas on the weekend, I tend to keep my running around outfits very casual, but comfort is still key. 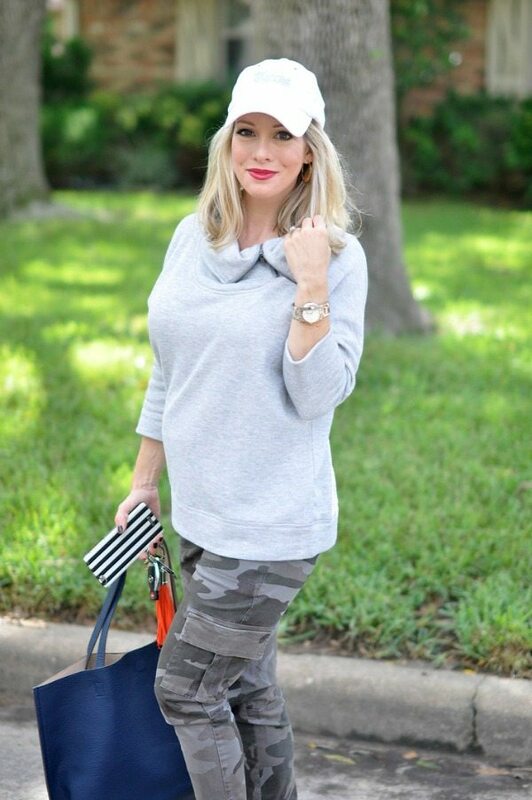 I have two sweatshirts I’m living in lately to share with you today. This first one is so so soft that it’s near blanket status. It comes in navy, purple, and black and is one of those tops you want in every color. I think it runs a little big (Caslon always does on me) and I’m wearing XS. I haven’t washed it yet, so it may shrink some. 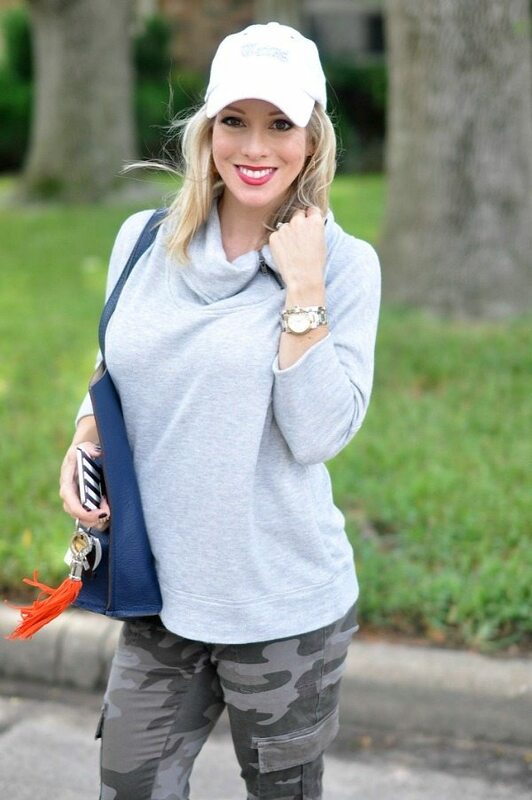 The other sweatshirt I’m crazy about is the Caslon Drape Neck Pullover (regular & petite). 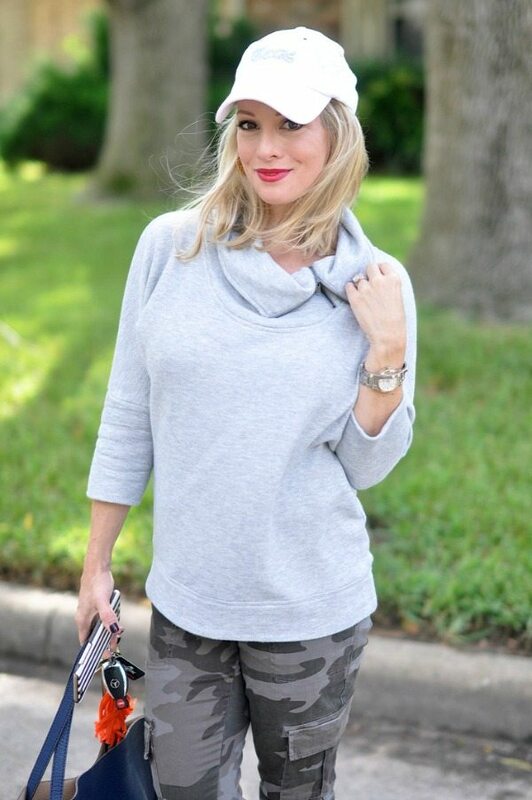 I don’t know why I love a simple, grey sweatshirt so much, but the zip-neck detail on this one makes it more special. I also like that both of these tops are 3/4 length sleeves. Better for right now, when it’s not super cold out. Starbuck’s has their fall flavors out now, what’s your favorite? I’m still opting for a nonfat white mocha with light whip. Mmmmm!!! I was lucky to find these maternity jean shorts on sale a few weeks ago, I’ve already gotten so much use out of them. They are A Pea in the Pod brand, but I don’t see this exact pair on their website, although I did find this similar A Pea in the Pod shorts at Macy’s. I did a search for maternity jean shorts and surprisingly found J. Crew makes them (this pair is cute -and on super sale – but sizes are limited). GAP also had 1969 boyfriend shorts ($26.99) and 1969 Maddie denim shorts ($24.99) that looked good. If you haven’t tried on a pair of Skechers GoWalk sneakers, you are definitely missing out! I’ve had this same grey pair for a few years now and they are still wearing well and so cushiony and feel lightweight on your feet like slippers, but with more support. They come in lots of colors, and I have navy/white striped pair, but the grey ones are the ones I wear all.the.time. I’m already planning to wear these shoes when we go to the Nutcracker Market next month! So excited it’s almost here and my Mom gets to come with me this year! #girltime!! Lots of walking calls for these comfy shoes! You can tell I how much I love that reversible tote – I just got a second one in navy/cream. Hats are also good for windy days! Like I mentioned above, this top runs big, so I may have gotten petite if I wasn’t pregnant. 21 weeks now! You can read my latest bump update post here. 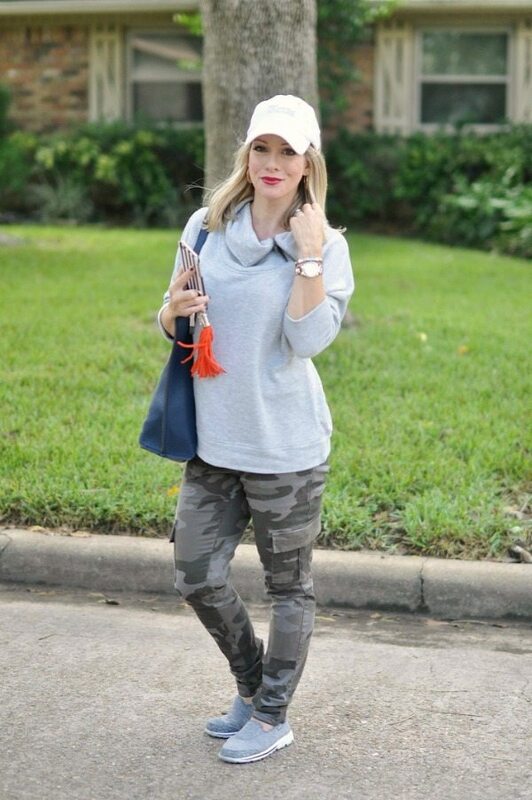 The camo skinny cargo pants are also maternity (on sale) and this pair of BLANKNYC camo skinny jeans is also marked down. 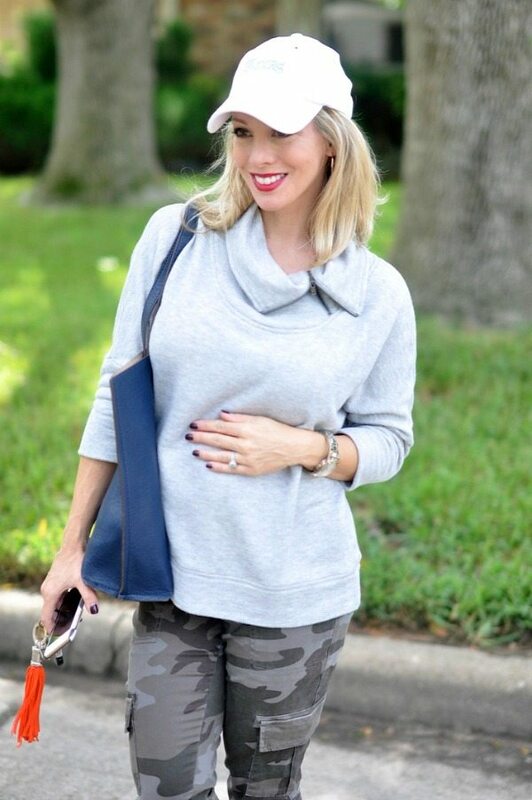 For you non-pregnant ladies, this camo skinny jean is 40% off, but sizes are limited and this camo skinny jean at NY&Co is pretty cute! Love Calson! Always so comfy. The few pieces I bought during the anniversary sale have washed well. I just hang to dry however. You look adorable and YOUNGER in these cute casual outfits. You look great in all of them but I love that tunic! I need one! And you've got such a tiny bump! You look adorable!